I planted a vegetable about a month ago, but I can't remember which veggie it is. Would anyone be able to help me guess the mystery plant? I thought it was either garlic or ginger, but I don't see any familiar plants online..
Gees, looks like a potato. But one couldn't forget planting a potato, right? Grins...I am being very bad! 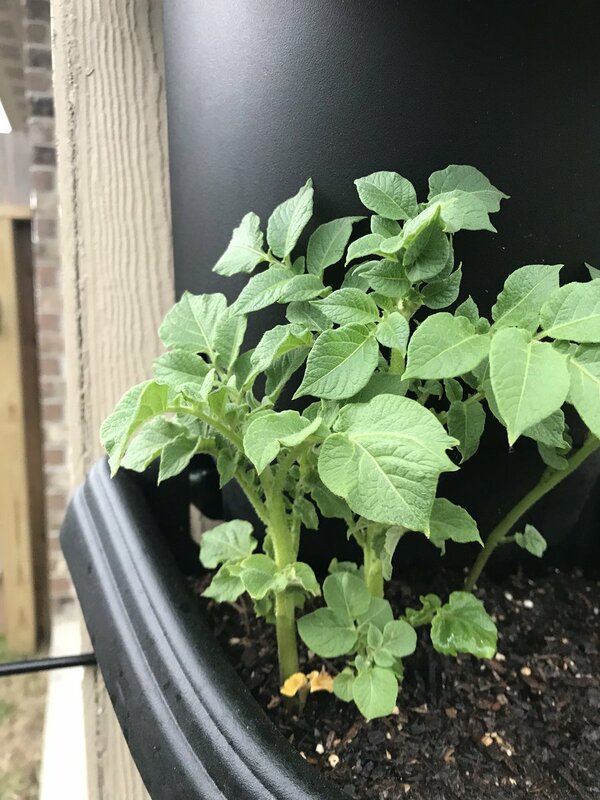 Potato would be fine planted in this humongous pot. Seeds of other plants, not so much. If you were thinking garlic or ginger...that would be closer. Do you think you planted this potato using seed? Or do you remember cutting potatoes into sections with an eye or two to plant? This looks like potting soil. Is it? That would be perfect. If you used a few shovel fulls of garden soil, you might have scooped up a chunk of potato from a previous harvest? Using compost not decomposed? Hey, I could be wrong! Sure does look like a potato, but another guess would be a potato-leaved tomato - an heirloom like German Pink or Brandywine, maybe? The leaves should have a vague tomato-y scent if this is correct. Not the answer you're looking for? Browse other questions tagged vegetables leaves container-gardening or ask your own question. What happens if you plant lettuce in hot weather? What is causing curled leaves on different varieties of citrus? Why did my red bell pepper become tan colored? Why are my Bell pepper leaves deformed with contoured edges?